The Unsinkable Kristen Chapman: A Picstravaganza! I usually try to avoid all picture blogs, because twenty pictures are never quite so funny as one really appropriate one. 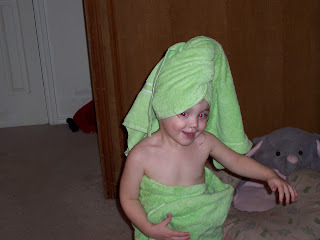 However, today I will let my standards slide because I just uploaded a host of pictures and one video that were much too cute/funny/weird not to share. Here is the Tot in her new favorite past time - singing from her bible "reading" the words with the flashlight she "borrowed" from her Pops and in her words "is still borrowing". Oh, and my battery died right in the middle of it, so sorry about the rather abrupt ending. 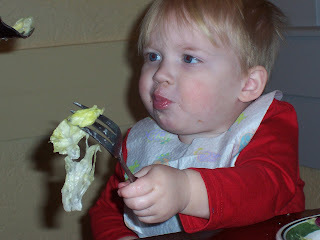 Little David masters the fork at Olive Garden. He insists we all try the veal salad. Here is the previously mentioned card Tot drew while I was making the breakfast she didn't eat. 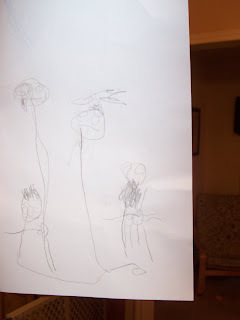 She has drawn all of us at our correct heights, the only discrepancy being Little David's eight legs. But she's three, so we'll give her a pass on that one. 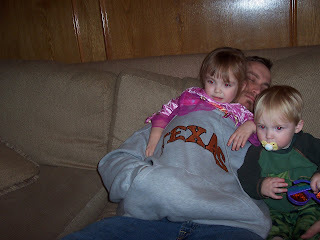 Tot decided that Daddy's sweatshirt was "just my sleeping bag size". This was dinner Friday night. 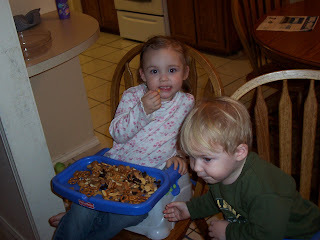 At this point I had obviously given up on getting them to eat real food and figured that at least she was getting some raisins in the chex mix. 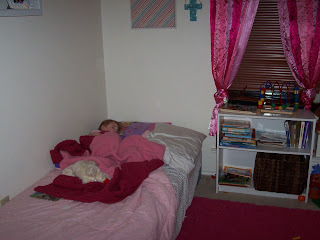 Tot in her Real Big Girl Bed. As mentioned, I was tired of curling up in a bed the size of my double kitchen sink. She has successfully spend the night in it and has proclaimed it "way cool". And I thought my glasses made me unique. 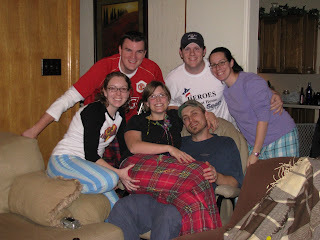 New Years Eve hilarity ensued. I wondered how long it would take for someone to notice that. Dave looks really tired! Just isn't the same staying up late anymore with small children, huh?! 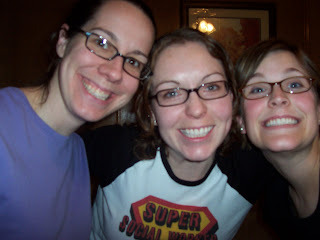 I barely stayed awake on our drive home from Darren and Susan's! Peyton did though...that giel was up till 12:45!!! 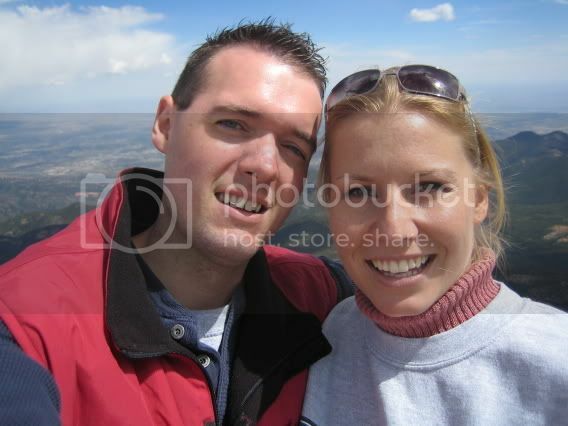 Yeah, funny enough, Dave doesn't remember anything about the pictures. We took about 20 pictures right around midnight and he remembers nothing, even though for several of them he was kissing me. Doesn't say much for my make out skillz. LOOOOOVe the sleeping bag shirt! Wow, that wasn't just a simple slap... there was definitely "grabbage" going on.